Verdict: There are much better keyboard out there for the price. I got this keyboard about 2 years ago from a friend whom bought them in bulk from a reseller. This was the first gaming keyboard that i ever purchased and prior to that i only ever used Lenovo, IBM, Dell and HP keyboards that were bundled with their computers (i also had Apple keyboards). The first visual impression i got from that keyboard was the whoa factor, the piano gloss finish of the keyboard’s bezel is something that hits you when you first open the packaging box, and the rubberised keys are something that i like very much (since it is very much like the Thinkpad X30x keyboard). After plugging the keyboard into the computer for the first time, i didn’t know how to get the backlight on the keyboard working, so i had to resort to reading the bundled operational manual to learn how to switch on the keyboard backlight (picture 1). Picture 1. 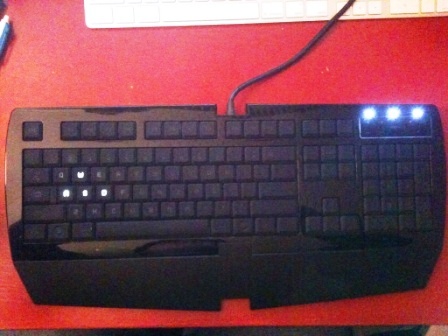 The Lycosa keyboard without any keyboard backlight on. Picture 2. 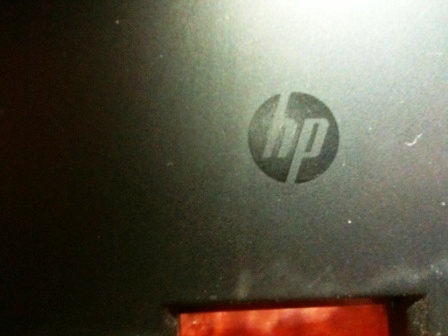 HP logo on the keyboard palmrest. Picture 3. 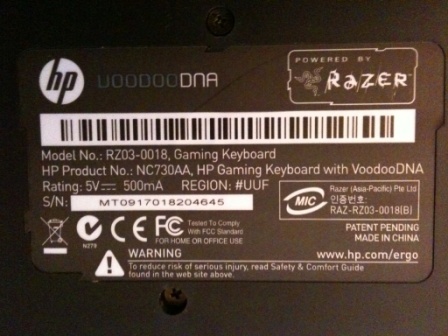 HP VOODOODNA logo on the back of the keyboard. While this keyboard has the HP and VoodooDNA branding, it is actually just a re-branded regular Razer Lycosa keyboard, so all the drivers and operational methods are the same. However apart from the change of branding logo, there is another important difference between the HP Lycosa and Razer Lycosa keyboard, which is the colour of the LED backlight. In the Razer model the backlight colour is blue (picture 4), while in the HP model it is white (picture 5), which in my opinion is more superior since it is more easier to live with then the blue backlight. Picture 5. 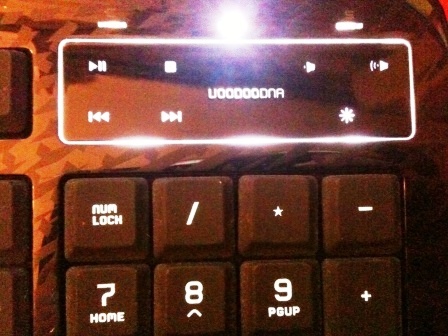 The HP Lycosa keyboard with the white backlight switched on. 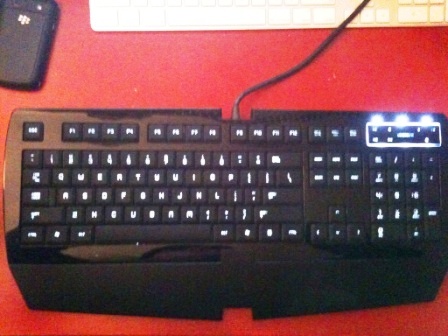 The characters on the keyboard without any backlight illumination are nearly impossible to see, unless there is lot of ambient lighting in the room, which can be seen as either a positive or a negative. It is a positive as some people are really good touch typists and have memorised all characters on the keyboard, and don’t want to be distracted by the characters on the keyboard (some Filco keyboards can be ordered with no printed characters on key). While it is a negative for people whom want to see characters on the key without using the keyboard backlight, which is very hard to do unless there is strong light source shining on the keyboard. Picture 6. The LED status light for CAP, SCROLL and NUM LOCK. 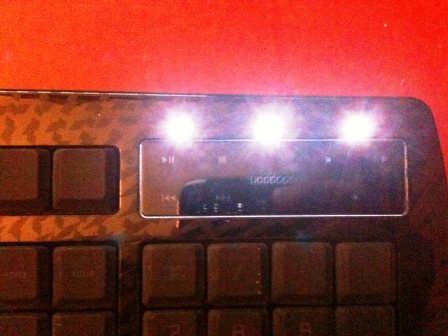 The LED status light for CAP, SCROLL and NUM LOCK on the HP Lycosa are very bright like it is on the SteelSeries 7G (http://thinkorama.wordpress.com/other/keyboards/steelseries-7g/), however the actual LED are hidden behind a small slit, which makes it more bearable to the eyes then those one on the SteelSeries 7G keyboard. Picture 7. Capacitative touch sensor panel on the keyboard. There is a capacitative touch sensor panel on the top right corner of the keyboard, shown in picture 7, which allows you to control volume, backlight of the keyboard, and multimedia playback (play, stop, etc). The keyboard allows you to disable the windows key, by Pressing VOODOODNA logo on the sensor panel and then the windows key, you can reactivate the windows key by repeating the steps, which is quite handy and only something that i found out recently. However, for some reason the keyboard doesn’t have a sound mute button, which is a serious omission on any gaming keyboard. Picture 8. Cycling between off, WASD cluster, fully on backlight. The backlight of the keyboard can be cycled between fully on, WASD cluster lighting and fully off, by pressing the button on the touch panel. Picture 9. 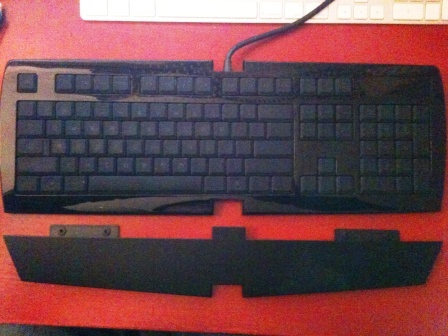 The keyboard with the palmrest removed. Picture 10. 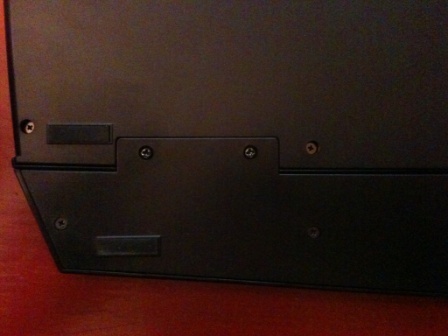 Screws holding down the palmrest to the main keyboard body. When i type on the Lycosa keyboard i find that the integrated palmrest doesn’t do a lot in supporting the palm of the hand, due to the excessive curvature of the keyboard (chasing form over function). Luckily the palmrest can be removed by unscrewing the 4 screws (2 on each side) that holds down the palmrest to the keyboard (shown in picture 10) and thus allowing you to use your palmrest. The keyboard without the palmrest looks very odd (shown in picture 9) and very hard to type on. The keys on the Lycosa keyboard are all coated in non-slip rubber finish, which i really like, as decreases slipping during typing and gaming, but it does absorbs oil from the finger easily and can be hard to clean after frequent use. While, the key individual finish are nice, the tactility of the keyboard’s key mechanism are extremely poor as compared to even a 15 dollars Microsoft or Logitech keyboard. The key travel even though is quite short, doesn’t very feel smooth and can give you a feeling of it been stuck, which makes it a very bad keyboard for typing long documents on. 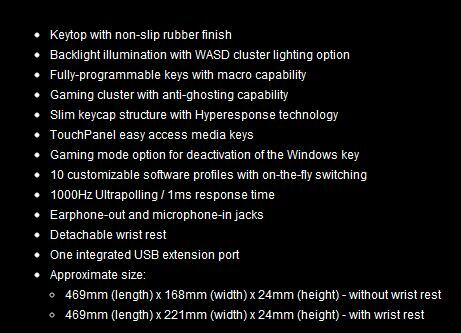 According to the specification of the Lycosa keyboard, the keyboard has anti-ghosting capability, programmable keys with macro capability and ultrapolling rate of 1000 Hz, all of which are quite useful for gamers. However, one thing must be said 1000 hz polling rate are useless due to the built-in debouncing feature and thus would limit the maximum polling rate of 200 hz. Also, the ultrahigh polling rate on USB keyboard would also cause an increase in the CPU load. Picture 12. 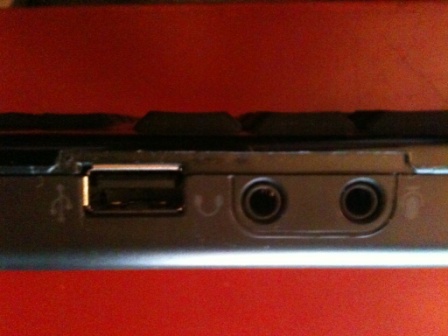 Mic/Headphone port and USB port. Picture 13. 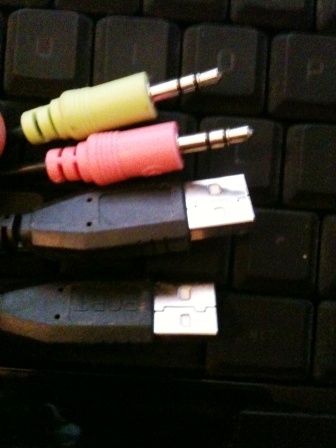 Connectors of the keyboard. On the keyboard there is an extra usb port (usb 2.0) and mic in/headphone ports (picture 12), which maybe useful for gamers. 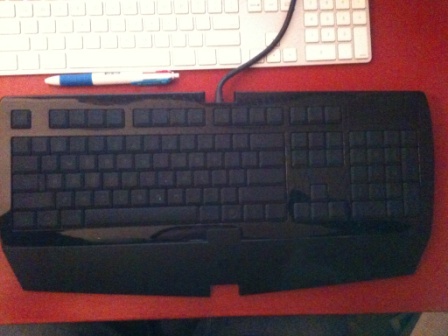 All in all, the Lycosa keyboard looks good, but doesn’t work as well as it looks. 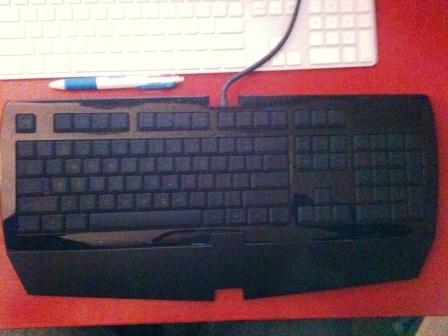 The typing experience is terrible for a keyboard at this price and ergonomics of the keyboard palmrest is poor. There is lot better keyboard on the market at half of its asking price if you can live without the gimmicks (i.e.LED keyboard lighting).